I’m looking ahead at my weekend calendar, and I do believe I see a few planes swirling around the numbers. Saturday, February 12, is the kickoff for the Centennial of Naval Aviation with a big air show at NAS North Island on Coronado, which is just a lovely bridge-ride over the bay from Downtown San Diego. There’ll be lots of planes flying—including the Blue Angels, whom I haven’t seen since I was a kid. And there’ll be lots of planes and helicopters to climb into, too. Does anyone else think that sounds like a great day out for three six-year-old boys? 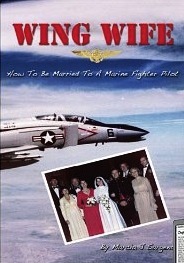 And if my week plays out as it should, I’ll be in Coronado the night before, too, at Bay Books for the signing of Wing Wife: How to Be Married to a Marine Fighter Pilot, written by Marcia J. Sargent. I’ve been working with Marcia on her young adult projects, and then she goes and writes something for grown-ups. Sheesh. Some people. So it looks like I’ll be walking around with my head in the clouds for a couple of days—with fast planes and a book about life with fast planes. Sounds like fun to me.